Room 227 opens to public at 5:30 p.m. All events are FREE and subject to last minute change or cancellation. Chicago, and Los Angeles during the 1960s and 1970s, for which there will be an accompanying exhibition. One of the most influential and innovative photographers working today, Philip-Lorca diCorcia is known for creating images that are poised between documentary and theatrically staged photography. His practice takes everyday occurrences beyond the realm of banality, infusing what would otherwise appear to be insignificant gestures with psychology and emotion. DiCorcia employs photography as a fictive medium capable of creating uncanny, complex realities out of seemingly straightforward compositions. As such, his work is based on the dichotomy between fact and fiction and asks the viewer to question the assumed truths that the photographic image offers. DiCorcia was named one of Martell’s 2012 Artists of the Year, which was accompanied by a touring exhibition in China. He has participated in numerous solo and group exhibitions worldwide. In 2013, a large European survey of his work was held at Schirn Kunsthalle Frankfurt in Germany and Museum De Pont in Tilburg, The Netherlands. Martha Rosler is an artist whose work often focuses on the public sphere and landscapes of everyday life, especially as they affect women. Her photographic series on places of passage and systems of transportation— airports, roads, subways, streets—have been widely exhibited. She publishes often on art and culture; her book Culture Class was published in 2013.Rosler has for many years produced works on war and the “national security climate,” connecting everyday experiences at home with the conduct of war abroad. 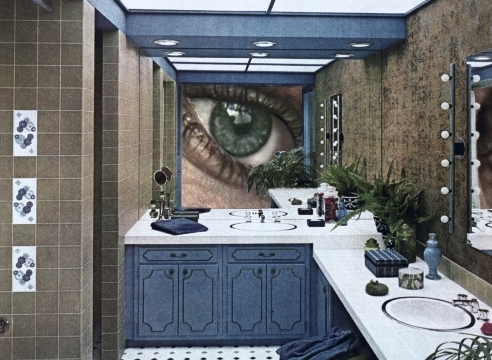 In 2004 and 2008 she reinstituted her now well-known series of photomontages “House Beautiful: Bringing the War Home,” originally made as a response to the war in Vietnam. In 2013 Rosler’s series of public banners on drone warfare and surveillance was shown at the Look3 Photo Festival in Charlottesville, Virginia. Her performance and installation Meta-Monumental Garage Sale was held at MoMA, New York, in December 2012.